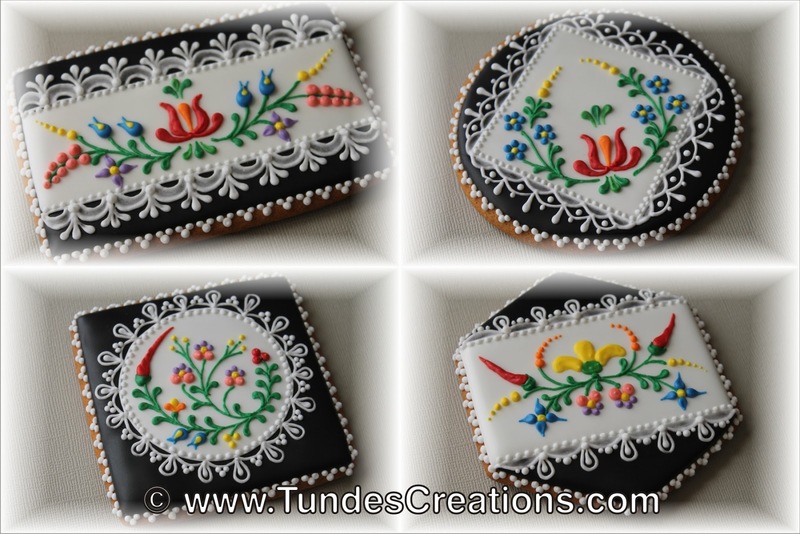 The Gingerbread Artist: Hungarian folk art flowers on black and white 1. Hungarian folk art flowers on black and white 1. I created a full series of these black and white based folk art cookies. I already posted one of them earlier. As this is a very popular design (my Hungarian folk art flower cookie classes are popular), I decided to make videos for those of you who are trying to learn it at home. These four videos are ready and I will post more later. I also created a Youtube playlist for the folk art design cookies. Hi Tunde! I thought of you and the Hungarian designs before I came to your site and saw your current post. I gave a big smile reading your comment re ... those of you trying to learn at hoe. hahhaa That's me! I'm off to view your videos. Love the designs. I viewed these on your home site and will go to youtube too. Just beautiful! I don't know the size of cutters used but am thinking they have to be pretty big. Though I've tried this before i think mine were to small to accomplish. I love your work! Hi Dona, these cookies are around 4 inch in size. The one I posted earlier is a 6 inch. I like bigger cookies, they make great gifts. You know, sometimes a dozen is too much if you just want to give a little something, like instead of a card. Hungarian folk art flowers on black and white 2.